Mi a1 is the first Android one phone from the Xiaomi mobile. And many Android fans already using this device for a long time. And most of them are waiting for the Android P on Mi A1. 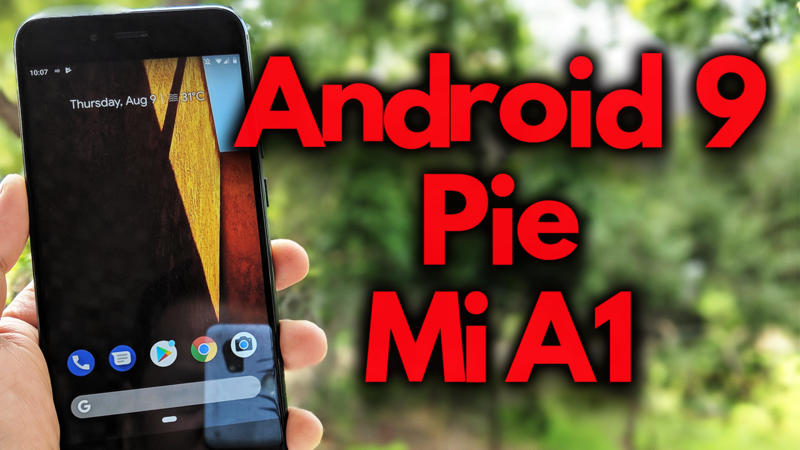 Now the wait is over and MI A1 user can enjoy the Android Pie 9 on MI A1. All credit goes to the XDA developer joeyhuab, who ported the Android Pie 9 on the Mi A1. A few months back Google releases the Developer Preview of Android P of Pixel phone and Other phones users. After that many developers tried there hand on the Android P and posted the same for other phones. Now Mi a1 users can also enjoy this next-gen OS on their phones. If you are the Mi A1 phone user and want to test the Android P on your phone, then follow the below mention guide on your device and download Android P on your Mi a1. The guide is a little bit longer but not so hard. All you need Mi a1 phone with a custom recovery to flash some files on the phone. Currently, the android P is in the beta stage and you will see some bugs on the phone, but you can fix most of them by flashing some files. So let take a look at how to work and How to Install Android P Beta on Mi A1 Phone. Download all the needed files from the download section and save it on your windows desktop. Yes, you need a PC and Fastboot files to run some fastboot commands from your PC. This guide is only for the Mi a1 users and don’t try this method on any other Xiaomi phones. So read all the steps very carefully and follow all of them one by one. One wrong step and you will brick the phone. Download TWRP-fastboot only and unzip the folder on your desktop. Copy the TWRP img file in the platform-tools folder. Download CosmicDan’s TWRP Installer zip file here and save the zip file on your phone’s internal memory. Download latest Vendor.img for Mi A1 and save on your desktop. Download A/B system Pie PR 1 img zip file here and unzip the zip file and you will see the img file. Download POST-sGSI 1 Tissot zip and save the file on the desktop. Download POST-sGSI 2 Tissot zip and save the file on the desktop. Download a treble-compatible kernel here and save the file on the desktop. Download Magisk 16.7 here to get the root access on your phone. 1. Enable USB debugging on your Huawei Android device. To do this go to your Settings -> About -> Software Information -> More -> Now Tap on the Build Number 7-8 Times until you see a toast message “Developer option enabled”. Now go back to settings -> Enable the OEM Unlock by going to Settings -> Developer Option and Enable OEM Unlock and USB Debugging. See the screenshot below. 2. Boot your phone in fastboot mode. To do this switch of your phone and Hold the Volume Down + Power button. 3. 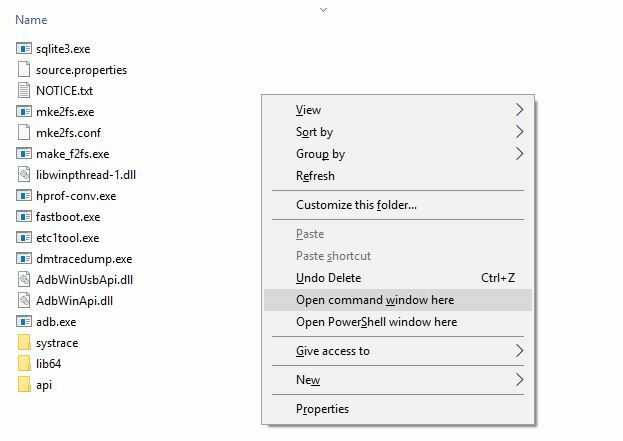 Open a command prompt window inside the Platform Tools folder: Holding Shift key + Right Click > Select Open Command Window here. 4. Connect your phone to the PC with USB cable and run the following command to unlock the bootloader of Mi a1. 5. Once the bootloader is unlocked, again boot your phone in fastboot. Open the Platform tool folder in which you saved the TWRP img file and extracted from the zip file. 6. Enter this command to boot your phone in TWRP mode. 7. Now in the recovery install the CosmicDan’s TWRP Installer zip file. After that go to Reboot > Recovery. 8. Now the CosmicDan recovery is installed on your phone. Go to Advanced and click Tissot Manager and choose the repartition user-data option. Then select single-boot option then click repartition. 9. Now save the Vendor.img file on your phone. If you can’t see the MI a1 connected on your PC. Go to Mount and Enable MTP option. Now save the Vendor.img file. 10. Now in the TWRP go to Install > Tap on Install Image option and select the Vendor.img file as Vendor Image. 11. Go to Mount and Select Vendor Option. 12. Save A/B system GSI img on the phone and install the same as a System image. 13. Save POST-sGSI 1 Tissot zip on the phone and install as the normal Zip file. 14. Save POST-sGSI 2 Tissot zip on the phone and install as the normal Zip file. 15. Once all these files are flashed successfully on your Mi A1 phone. Flash a treble-compatible kernel on the phone. 16. Now again go to Tissot Manager > patches. Once there, patch the SELinux mode and set it to Permissive. 17. Now flash the Magisk 16.7 on your phone to get the root access. Now the phone will reboot and the first boot take 10 to 15 minutes. Between this time your phone will reboot 3 to 4 times so don’t worry about that. Now the Android P is running on the Mi a1 phone. If you are facing some problem after installing the Android P. Below are some fixes which you can use on your phone. a) Install Latest Google Service Framework to Run the Google apps. b) To enable USB MTP, enable Developer options in the About phone section of the Settings app by tapping the Build Number 4 times. Then look for the File Transfer option in the Developer options. c) To enable Nav Bar. Install this Magisk Module on your phone. d) For camera install this Google camera apk on your phone. f) Install Gcam Fix file and flash with TWRP. Download link POST-sGSI 1 Tissot.zip not found the file. Please upload again ?